The torturers at the forced labour camps often bind detained Falun Gong practitioners to a ladder, forcing them to "sit parallel on the ladder" for extended periods of time. Not having access to a ladder, we demonstrated the torture using a board instead. The perpetrators seal practitioners' mouths with tape to muffle their agonising cries. They also bind practitioners' hands behind their backs and use the tape to force their heads forward with their chins against their chests. The ladder used in the actual torture is the type of metal ladder commonly used on the bunk beds found in prisons, labour camps and detention centres in China. "Flying the Airplane" (also translated as "Backing Up the Airplane") is another of the torture methods that the persecutors in forced labour camps commonly subject practitioners to. The actual torture is more severe than the demonstration in the photograph above. The torturers force practitioners' upper bodies and feet even closer to the wall with brutal force. 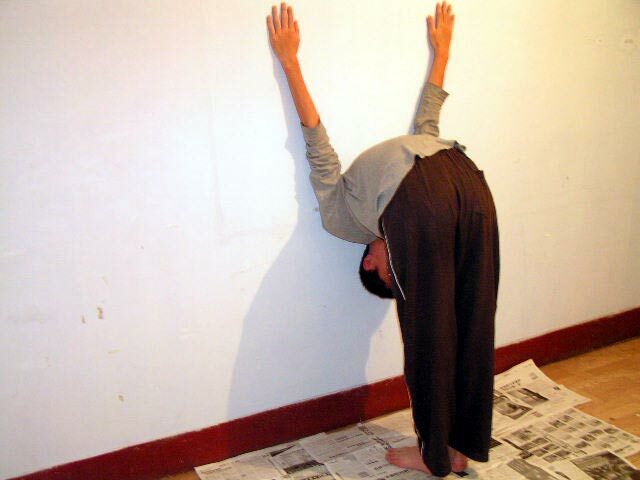 When the toes almost touch the bottom of the wall, one naturally wants to bend his knees to avoid injury to the tendons and the waist. But the torturers pull practitioners' knees away from the wall using towels in order to force their knees to straighten up. Whenever practitioners' arms give out, the torturers pull their arms back into the raised position, forcing them back into the agonising posture. Anyone subjected to this torture is soon soaked in sweat due to the excruciating pain. This type of torture is used on hands and toes, and is frequently used on Falun Gong practitioners. The toothbrushes used in the actual tortures have much flatter handles than the ones in the photographs. The torturers would insert a toothbrush with a flat handle between two fingers of the victim. This type of torture is usually performed by former practitioners who have renounced Falun Gong (the so-called "Reformed") who now participate themselves in the mistreatment of steadfast practitioners. The "Reformed" do this in exchange for the promise of no more torture against them and the reduction of their prison terms. They are also referred to as "collaborators" in this article. One collaborator makes sure that the tortured practitioner's fingers clench the toothbrush firmly while another collaborator uses both hands to keep rotating the toothbrush until all the flesh in contact with the toothbrush is worn off the fingers and the finger bones are exposed. We personally know a practitioner in Beijing, Mr. Cheng Wei, who was subjected to this torture while being illegally detained in the Second Group of Tuanhe Forced Labour Camp in Beijing. The collaborators kept abrading his fingers until the finger bones were exposed. It takes several men to hold the victim to the ground during each finger-grinding or toe-grinding torture session, because the victim will be compelled to struggle fiercely due to the excruciating pain. How painful it must be for the victim during each slow progression of torture! The torture requires the help of several men who are indifferent to witnessing a person's agony while they restrain the victim, otherwise such torture could not take place.